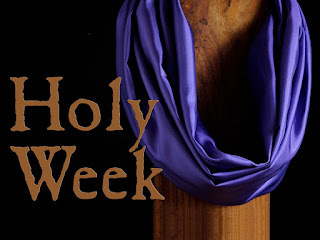 Sunday was the second Sunday of Easter. Most people know Easter marks the day Jesus rose from the grave. But not everyone knows there is a whole season of Easter that continues for several weeks after Easter Sunday. Jesus appeared to his disciples on Easter, but he also appeared many times in bodily form over the next few weeks. So for the next few weeks, we will study some of those stories. And the main idea I want us to consider is does Christ still appear to people today? Have you ever seen Jesus? Have you ever touched his scars and how? I want to read a story from John 20:19-29, which details two separate times Jesus appeared to his disciples. I will make some comments as we read through the passage. 19 That Sunday evening the disciples were meeting behind locked doors because they were afraid of the Jewish leaders. Suddenly, Jesus was standing there among them! “Peace be with you,” he said. 20 As he spoke, he showed them the wounds in his hands and his side. They were filled with joy when they saw the Lord! First of all, I want you to notice Jesus came in peace. Maybe you would be afraid to see Jesus. I mean, if he really were alive and going to pay us a visit, we might be ashamed because of something we weren't doing right in life. Or maybe we would be afraid he would be angry with us or would want to punish us. The disciples were afraid. They locked the doors to the upper room because they were afraid of the Jewish leaders. But they might also have wondered if Jesus would be angry with them for the ways they had failed him. Would he come to scold them or punish them? But Jesus reassures the disciples saying , "I come in peace." And Jesus' visit was a good thing. It filled the disciples with joy when they saw the risen Lord. He was glad to see them and they were glad he came. We don't have to be afraid to see Jesus either. If he were to come pay a visit, he would come in peace. He loves you and wants to reassure you. It would be a good thing and would fill you with joy. So don't be afraid to look for the risen Lord. In Luke and Acts, the Holy Spirit does not come until the Day of Pentecost. The Gospel of John seem to indicate the Holy Spirit was given in when Jesus met with the Disciples and Thomas (although some have said it this was just a symbolic act from Jesus to show the Holy Spirit would be given). Whether the Holy Spirit came at this time or at another time or at multiple times, the main point of this passage is the Holy Spirit will always be with us. That will be an important idea we will address again in a moment. But first, let's go on with the passage. 26 Eight days later the disciples were together again, and this time Thomas was with them. Here we have a second appearance of the risen Christ. This one was one week later. Again, it was on a Sunday. So, notice, that both of these appearances happened on a Sunday. Sunday is a special day. It is known as "the Lord's Day." Technically, Saturday is the Sabbath (the seventh day) because that is the day God rested after 6 days of creation work. But here we see that right after Jesus rose, the Disciples are meeting together on Sundays. And it became the custom for Christians to meet for worship on Sundays, which they called "The Lord's Day" because he rose on a Sunday. Sunday is a special day. Every Sunday is a little Easter. And it would seem Sundays are a day when we can encounter the risen Christ in a special way when we gather in the church with other believers. If you want to see the risen Christ, I recommend you start by going to church on Sunday. Right here at the end of the passage, we see that Jesus has made a distinction between the Disciples (who saw Jesus and believed) and us (who have not seen Jesus and yet still believe). And Jesus said we are more blessed because we believe without seeing. The Disciples—including Thomas—were able to witness for Christ in an exceptional way because they saw the resurrected Christ. In 1 John 1:1, the beloved disciple said, "We proclaim to you the one who existed from the beginning, whom we have heard and seen. We saw him with our own eyes and touched him with our own hands. He is the Word of life." They had seen Jesus while he was alive. They had seen him on the cross. They saw him in the grave. They saw him, heard him, and touched him after he rose from the grave. Thus, they were absolutely convinced Jesus was alive and that he was their Lord and God (as Thomas put it). It had to be that way for the very first disciples. There had to be a firm foundation. I believe that is why the resurrected Christ appeared in bodily form to the 11 disciples and so many of the first Christians in the days immediately following Easter. Jesus wanted to absolutely convince them so they could build a firm foundation for the church. We needed them to see Jesus so we can be assured our faith is built on something solid. And yet, Jesus also said we are more blessed because we have not seen. Jesus walked on the earth in bodily form after his resurrection for 40 days. Then he ascended into heaven. We recall this essential element of our faith every time we recite the Apostles' Creed. We say, “…He rose from the grave, He ascended into heaven…” Perhaps we do not experience the resurrected Christ now in the same way the disciples did in the first 40 days after his resurrection, because Jesus has ascended. We can still see Christ. He is not dead; he is alive! But we may see him in a different way because he has ascended, whereas he appeared to the disciples in bodily form. Most Christians overlook how important it is that Jesus ascended to heaven. Because Jesus ascended, we now have the Holy Spirit. And through the Holy Spirit, Jesus can be present everywhere at once. You see, a body can only be in one place at a time--it is limited by time and space. That is why Thomas missed out of Jesus' appearance that first Sunday. Remember, he wasn't in the room with the other. He was off getting the oil changed in his camel or something. Why didn't Jesus appear to the 10 disciples in the upper room and to Thomas at the same time down at the camel service station? Jesus couldn't, because he was a body and not a spirit. But we are more blessed because now Jesus is present in the Holy Spirit and is not limited by time and space. So Jesus can be present right here with me as I type the words of this blog and he can be present with you wherever you are reading them. As the Holy Spirit, Jesus can be everywhere at once. We are also more blessed because we believe Jesus rose based on faith. Faith is very powerful. Faith helps us see Jesus in more ways than the Disciples did at first. They could only believe if they saw his nail scarred hands. But we can believe and see Jesus when we gather together to serve in God's name. If we believe, we can see Jesus there in that moment. If we believe, we can see Jesus when a mother loves her child sacrificially. Through faith, we can see Jesus in her actions. Through faith, we can see Jesus when a father forgives his son. Through faith, we can see the risen Christ is with us when we take our own father to the hospital for a critical surgery. Because we believe, we know we are not alone. We can see Jesus through our Christian friends who support us and pray for us and help us when we need it most. Faith helps us see Jesus is more than just a man's body walking around with nail scars on his hands and a wounded side. Increasing faith is the mark of mature Christians. Think of those Disciples in this story; think of Thomas. They were only baby Christians--just born really. And They needed to see Jesus. When we see a child, maybe two-years-old, that child might cling to its mother's leg. It might not ever want to let go. And if Mama leaves the room, the child's whole world falls apart and it is afraid and may even cry uncontrollably until Mama comes back into the room. That's normal for a two-year-old. But eventually, the child grows up and matures and becomes a college student and may even move away to another town to attend school. You wouldn't want that child to still be clinging to its mother's leg all the time. No. The child is grown up now and has faith that their mother is still there. She is still alive. She still loves them. They will still see each other again. And so it is with more mature Christians. We don't need to see Jesus in bodily form all the time with us. Through faith we trust he is there. The Disciples would eventually mature in this way too. At the beginning, like babies, they needed to see Jesus with them. But they would eventually grow up and spread out to do amazing things because their faith matured. Thomas' faith led him to travel all the way to India. To this day, there is a community of Christians in India that trace the founding to the Disciple Thomas who brought the story of the risen Jesus to their community. Faith is a powerful thing. Jesus is alive. He is not dead. And we can see the risen Christ, through faith. He still appears to us today. He may not appear in bodily form as he did for the disciples and Thomas in our scripture reading, but he shows up in other ways. Do you have faith to see him? It is not enough to just know Christ intellectually. It is not enough to read and memorize the things he said or to know historical facts about him. We must actually see him, in some sense, so we know he is alive and real and participating in our lives. It is not enough to be a Christian because your parents or grandparents were. It is not enough to be a religious person who follows the religious program of Jesus and his Church. It is not enough to mumble an empty prayer into the air, not believing there is a living Savior listening. No. You must see that Jesus is alive and he is here and he is listening to your prayer and will answer according to his great wisdom, power, and love. We will probably see Jesus is different ways than the Disciples, but we can still see him. We need to see him, through faith. Jesus showed the Disciples and Thomas his scars to prove it was really him. You see, he wanted them to believe. He wanted Thomas to believe. That's why he came back a second time when Thomas was there. Thomas said he wouldn't believe in less he saw Jesus and his scars for himself. So Jesus came, because Jesus wants all his followers to believe. And if that's what it took for Thomas, that's what Jesus was willing to do. Which proof do you need in order to believe? Jesus wants you to believe. He is willing to help you. Maybe you don't need to see the scars like Thomas, but you might need something. What is it? Why don't you ask Jesus to show you? He wants you to be secure in your faith. So why not ask him to help? Do you ever feel like you are sawing away at life, but not getting anywhere? The other day, we had a birthday party for my daughter Grace. She wanted to have here friends over and wanted to have a camp fire to sit around. I meant to by a bundle of firewood at the store, but forgot. We only had about 15 minutes before dark, so I dragged a fallen tree from the woods behind my house. I grabbed my chainsaw (which hasn't been used in about a year) and tried to cut the tree up into firewood. The chain was so dull it would hardly cut. I should have paused to sharpen the chain and it would have made quick work of the tree. However, it was almost dark and I didn't want to be cutting wood in the dark so I just kept trying to cut that tree up with my dull saw. It was loud and the chain was smoking as the dull blades grinding against the wood--more burning it than cutting it. It took three times as long to cut the tree with the dull saw (and it was more dangerous too). It’s important to take time to sharpen your saw. That's true of chainsaws and yourself. We need to make sure we sharpen our mental, physical, and spiritual abilities. Otherwise, we will just be loud but not very effective. Lent is a great time to resharpen. 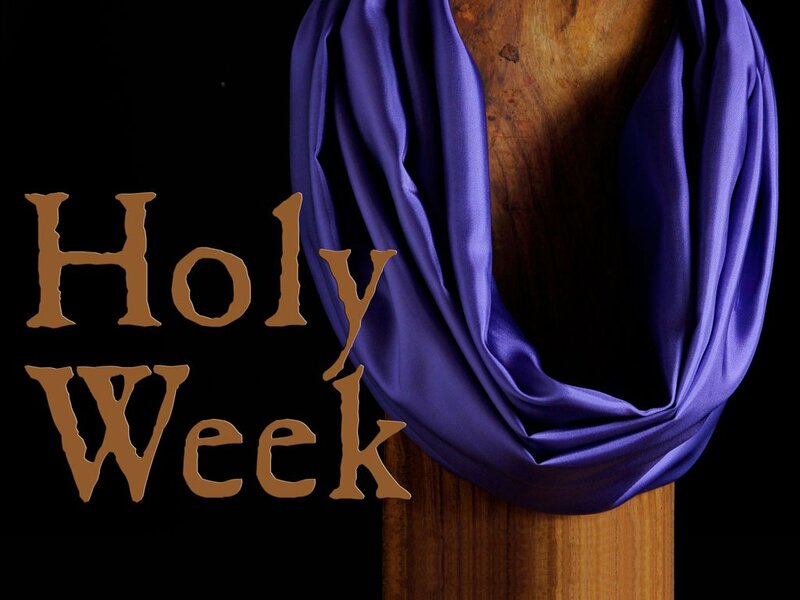 Lent is the 40-day period between Ash Wednesday at Easter Sunday when Christians prepare for Easter through prayer, study, and service. Our focus on prayer, study, and service helps draw us closer to Christ so we can be sharp again. Jesus was a carpenter. I’m sure he understood the importance of “sharpening his saw” so it would cut well. Jesus certainly applied the principle to his ministry. He took trips and celebrated religious holidays (Holy Communion was originally a Passover meal Jesus celebrated with his disciples). And we read time after time how Jesus took breaks from his work to rest and pray. These “vacations” helped him stay physically, mentally, and spiritually sharp. Jesus took one such “vacation” near the end of his earthly ministry as he made his way to Jerusalem where he would be arrested and crucified. I want to share that story with you today. Mary and Martha were Jesus good friends. Spending time with friends can be a good way to relax and recharge. Jesus—ever mindful of the cross looming before him—sought solace in the company his good friends. You have probably known some people like Mary and some like Martha. Martha was all wrapped up in the work that needed to be done. Jesus came to relax and be with friends. That was the main point of his visit. Mary was doing just what Jesus wanted—resting and spending time with him. Martha was distracted by the big dinner and all the work she felt needed to be done. There’s a time for work and a time for rest. When you take a break or a vacation, take time to rest. Yes, there are details that you must attend to, but if you spend your whole vacation or visit distracted by organizing and planning and logistics you might miss out on what’s really important. I want to make three points today. First, everyone should take a vacation now and then. Second, I want to consider a Christian way to take a vacation that will make yours more fruitful. Do you realize that vacations were originally God’s idea? Think about it. Go back to the beginning of the Bible, way back in Genesis at the creation story. What did God do on the seventh day? … Genesis 2:2-3, “On the seventh day God had finished his work of creation, so he rested from all his work. 3 And God blessed the seventh day and declared it holy, because it was the day when he rested from all his work of creation.” God establish the Sabbath to give His people time to rest and spend time with Him. God gave us this special gift: a little mini-vacation woven right into the fabric of our week. And God declared it holy. In the Old Testament, the Law of Moses required certain vacations as religious obligations. In addition to resting on the Sabbath to keep it holy, there were also regular holiday festivals to be celebrated throughout the year. Furthermore, the Law encouraged faithful Jews to make travel to the Temple in Jerusalem often. Some strict Jews interpreted the law to mean they should travel to the Temple 3 times a year. The Gospel of Luke says Jesus’ parents went to Jerusalem for the Passover every year. The word vacation literally means to vacate – to leave. The word was first used to describe the long summer breaks taken by law courts and by wealthy Europeans who would “vacate” their regular home and move to their summer home. Ultimately, a vacation is to take leave from your normal daily activity and go or do something different. It can mean taking a trip to Florida; but technically, a business conference could be consider a vacation (in some sense) because you are taking a break from what you normally do (say sitting at a desk in your office) to do something different. A changes of pace—even if it is still work—can be refreshing. According to one article[i], “More than half of American workers left vacation time unused in 2015. This adds up to 658 million unused vacation days.” Some of the reasons people say they don’t take vacations are: returning to a mountain of work (37%), fearing no one else can do the job while they’re gone (35%), and trouble affording a vacation (33%). Does one of these reasons describe you? Vacations make you happier. Well, obviously, going on a vacation can be fun and relaxing and will most likely make you happy. But it’s more than just that. Research shows[ii], “People who come back from vacation are more satisfied with their lives in general when they return.” Calmer, more satisfied, mentally healthy people are actually better workers and members of society in general. Some may say, “Well, vacations just stress me out. All the packing and stressing over leaving on time and finding a place to stay and all the details of the trip…” Hmmm… that’s true if you’re acting like a Martha. Remember Mary and Martha from our scripture? Martha was all worked up about cooking the meal and all the work that needed to be done. Be more like Mary than Martha and just enjoy! Vacations make you healthier. They reduce stress. Vacations give your body time to recuperate and repair. According to experts, “Research has shown that people on holiday immediately feel healthier, have less physical complaints and even have a reduction in cholesterol levels on their return.”[iii] My summer vacation last year helped me establish a new healthy habit—a morning walk. you see, I'm an early riser and everyone else in the vacation house decided to sleep late. So what was I to do? I decided I would go for a walk each morning while I waited for the rest of the household to wake up. I took a walk on the beach and watched the sunrise while getting some healthy exercise. Well, when I got back from our vacation, I decided, "Why not keep this up?" So I started getting up a little earlier and taking a walk every morning. It's gives me time to pray, listen to the Bible or an audiobook, and start the day off with a little exercise. It's been almost a year now and I go for a 30-45 minute walk almost every morning. I might not have developed this healthy habit if I hadn't gone on vacation last summer. Vacations actually make you more productive. Vacations decrease job stress, employee burnout, and reduce absenteeism. Workers come who take vacations come back with a renewed vitality at their job and are actually more productive than before. So, a vacation can make you a more effective worker. I hope you will all consider the benefits of a periodic vacation. I hope any employers or supervisors who read this will consider how a vacation could help your employees help you and will encourage them to take time off now and then. I am convinced the Christian way of life is the absolute best. True Christians who follow Jesus whole-heartedly are the most joyful of all people on the planet, love life and live it to the fullest, and are also the very best employees and members of society. Christianity is not some set of religious rules we follow. It's a living relationship with Jesus that actually makes us better people when we apply our faith to every area of our life. How can we apply our faith to our vacations? Let me give you some tips. First, don’t take a vacation from your faith. You are still a follower of Christ even if you are in a different town. Don’t forget your values, your spiritual practices (prayer, devotions, worship time, etc. ), and your purpose (to love God and your neighbor). Take Jesus on vacation with you and it will be the best trip you ever took. Second, don’t be a Martha. In other words, don’t worry so much about all the details that you forget the main point—to rest and take a break from all the things you have to do in your regular life. It’s supposed to be a change of pace. Don’t let your own “Martha-like” tendencies keep you from the joy Jesus wants to give you during your vacation. Third, forget the world’s views about the perfect vacation. In the hilarious National Lampoon's vacation movies, Clark Griswold is always getting into trouble because of his unrealistic notions abut the perfect vacations. Don't be like Clark Griswold. Vacations aren't about making perfect memories for our kids. Vacations aren't about over-indulging ourselves. We can treat ourselves, but we don’t have to be selfish. Being too self-indulgent will not make you healthier or happier. Over indulging self-indulging actually feeds your selfish tendencies and makes you less happy and satisfied in the long run. Don't try to "keep up with the Joneses" or fall for the world's ideas about the perfect vacation. Keep it simple and remember what's really important in life is what's really important in a vacation too--love and relationships. Fourth, think outside the box on your vacations. Jesus was not a rich man. He was basically homeless and he lived in a poor peasant society. Yet Jesus somehow also managed to take regular trips and vacations. If he can manage it, so can you. Don’t fall for the world’s lie that every vacation has to be an elaborate, expensive, extravaganza. Something as simple as a walk through the park on a pretty spring day can qualify as a vacation. (Remember, Jesus would often retreat to a quiet place to pray). Sunday rest can be a vacation—if you are intentional about it. A religious festival—like an Easter egg hunt or a sunrise service or a Maundy Thursday service—can be a vacation. (Remember, a vacation is doing something different than your normal daily routine.) A spiritual retreat (like the Walk to Emmaus) can be a great vacation; it allows you to step away from the normal tasks of life and spend 3 days focusing on your spiritual life. A trip to see family or friends qualifies as a vacation (and can be a lot cheaper since you may be able to stay with them and not have to pay for a hotel or food). A short term mission trip can be an interesting and truly life-changing vacation. Even a work conference or some extra training can be a nice break from your regular daily duties as an employee and might be covered by your employer. The point is, your vacation doesn’t have to be a typical trip to the beach or a cruise to the Caribbean that costs thousands of dollars. And those trips may not be the best way for you to "sharpen your saw" anyway. Take time to sharpen your saw. People usually think of Christianity as a bunch of religious rules and obligations. That's not true at all. Christianity is an invitation to an ongoing vacation from the worries of a selfish life. 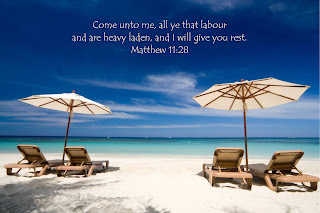 Perhaps this is expressed best in Jesus invitation from Matthew 11:28 where he said, "Come to me, all of you who are weary and carry heavy burdens, and I will give you rest." Christianity is an invitation to walk away from doing things the way the world says you must and to live differently--the way Christ lives. The Christian life is not always easy, but it is always good and wholesome and leaves you feeling refreshed and whole even when it is hard work that makes you tired. 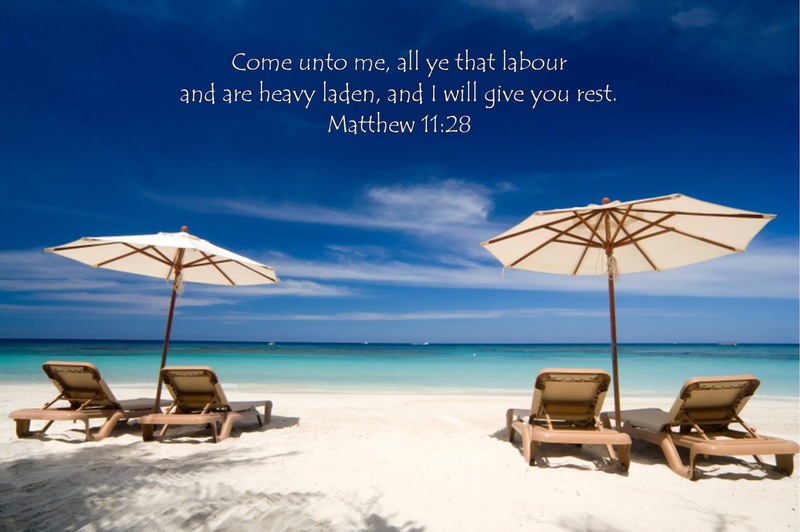 So I invite you--as Christ does--to walk away from your weary ways and come find true rest in Jesus Christ.